I find doing a job well deeply rewarding. Accomplishing a task, however seemingly menial, is intrinsically satisfying. Of course I couldn't complete the electrical tasks asked of me without the right tools for the job, and I value tools that are in good working condition. Feeling a well made tool in hand while tightening couplings, or stripping wire, or tightening screws is one small perk of the electrical trade. 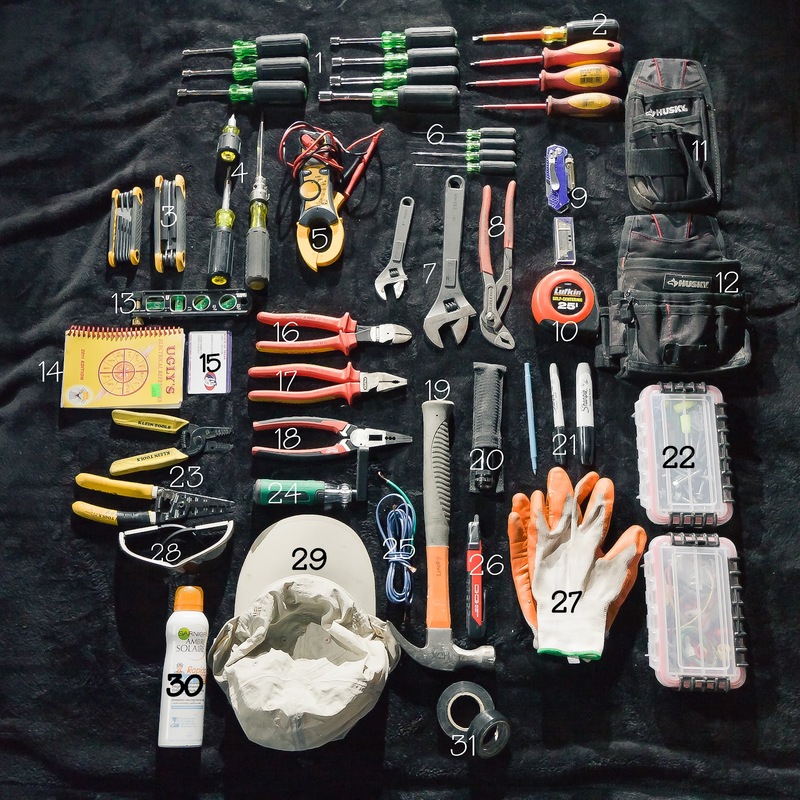 What tools do I have in my bag? I like to keep the tools in the same place in the bag, so that I can easily spot when one is missing. I have used an open face bag, but the tools fell out too easily. Instead I now use a backpack designed for electricians, and I would recommend it. It is a Klein Tradesman Pro backpack, and it frees my hands to carry other things, like conduit benders. It has been a very efficient addition to my kit. 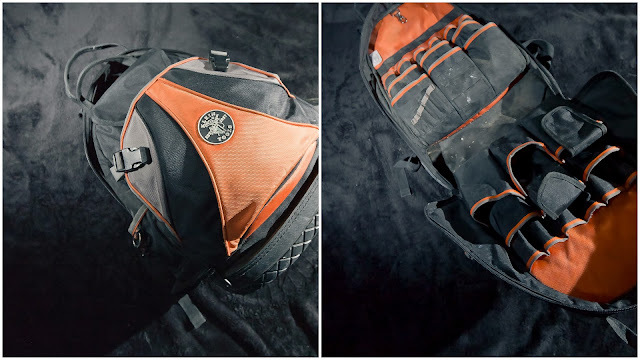 Tradesman Pro backpack with orange interior to improve visibility. 1. Seven Greenlee nut drivers. These work well because they are hollow, and long threads can protrude into the handle. 2. Four Maxpro set/screw drivers. Surprisingly few electrician tools are actually rated for electrical production, but these are. Tested for 1000 volts, these provide a little extra peace of mind, even though I never work on anything hot. 3. Allen Key / Hex head drivers. These are necessary for set screws in some service panels. 4. Screwdrivers. These are general purpose. The largest is a flathead that is used for tightening larger screws found on larger conduit, or general purpose. The midsize is a five in one, so I can carry one driver that will work with multiple screw heads. The smallest is a stubby multi tool for hard to reach places. 5. Voltage Meter. Great for checking for live circuits, continuity, and a great many other things. 6. Small screwdrivers. I like to use these for thermostat wire, and installing new thermostats. 7. Adjustable Wrenches. Most people call these Crescent wrenches, but since these are made by Dewalt, I couldn't call them Crescent. Not many electricians have adjustable wrenches in their tool belt, but I like to supplement the channel locks with an adjustable wrench. 8. Knipex channel locks. These pliers have a button to press for release, which makes them unique. Most electricians use two channel locks, but I am a little different. I like to use one channel lock on the conduit, and one adjustable wrench on the connector or coupling. 9. Kobalt folding box knife. This clips to my pocket so well, I keep it with me all the time. No need to sharpen the blade too. Just replace the razor, and it is super sharp in three seconds time. 10. Lufkin self centering tape measure. I don't use the self centering marks very much, but I do use the 1/8th marks often. I like that each fraction of an inch is labeled, and I don't have to count little fraction marks to get a measurement. There is nothing worse than a cheap tape measure that is hard to read. 11. Husky tool bag. I have a full tool belt, but these serve me well because they fit in my tool backpack, and I can slide them over my normal belt. These are great for holding hardware, or for holding my cell phone. 12. Husky tool bag #2. This one has been great because it holds electrical tape, tape measure, tools, and has a place for everything I need to hand. 13. Klein conduit level. This is a must. There is nothing more obviously wrong than conduit or service panels that are not plumb and level. Skewed conduit will look like amateur hour, and a nice level with rare earth magnets to hold it in place while strapping will make anyone look like a pro. 14. Ugly's reference book. Experienced tradesmen and novices alike reference this guide. There is so much information in it, and it is organized for efficient use. How many #12 wires can fit in 1 inch conduit? Need to bend an offset using a Chicago-type bender? Need to tie a double blackwall hitch knot? These can all be found in Ugly's. 15. Electrical Apprentice License. It must be kept to hand. 17. Knipex linesman pliers. These are useful because they cut wire, and can twist multiple strands tightly together. Linesman pliers might be the most important tool, behind the voltage detector. 18. Milwaukee long nose pliers. Stripping wire, knockouts, and bending J-hooks are made easier with this tool. It is advertised as having six different functions, but I use it for many more. It is always on my side. 19. Cheap Hammer. I don't mind having an inexpensive hammer because I use it to smash things with. Cheap hammers are great for this sort of thing. 20. Maglite LED flashlight. Electricians sometimes have to work in the dark. I prefer to have optimal lighting conditions, but when the lights are off, a flashlight is all that is available. 21. Sharpie pens. Sharpies are great for marking conduit when bending, or cutting. They are also useful when marking holes to be drilled. 22. Locking storage boxes. Sometimes we have extra hardware at the end of a job, and storing a few washers and bolts is a great idea. There are too many instances when I had small hardware to use instead of wasting time finding what I needed. 23. Wire strippers. Even though many other tools in my bag have wire strippers, it is more efficient to have a tool dedicated to one task. When stripping lots of wire, I need a wire stripper only that is not too heavy or cumbersome. One wire-stripper is for residential Romex wire, and fits the unique shape of the wire. 24. Wire nut tightener. This is a cheap tool that was given to me because it is a little crappy. It will save your hands if you need to tighten a bunch of wire nuts. 25. Extra wire. Like having extra nuts and washers to hand, having extra wire for grounding junction boxes saves time looking. 26. Milwaukee voltage detector with LED. This little tool is fantastic because it lights and beeps like a disco when it is near voltage above 50. I always check circuits before working on them, and this little detector has an led light that doubles as a small flashlight. I have been able to use it instead of climbing down the ladder to get a flashlight. Anything that saves trips up and down the ladder is golden. 27. Gloves. I like to have cheap gloves with a plastic grip coating so I can throw them away when they develop a hole, or begin smelling like cheese. Hands sweat like feet do, and gloves begin to smell like socks after a time. Throw them out, and forget about it. 28. Safety sunglasses. Protecting the eyes from harmful solar rays, and debris flying at your face is a good idea. I'm sure electrical work is harder with one eye. 29.Columbia sunhat with neck protection. The material is light, yet resistant to UV rays, and the hat protects my neck with fabric that hangs low in the back. I was looking for something like this because it is too easy to get a terrible sun burn while working outside. 30. Spray on sunblock. Sunblock is a necessity, but spreading greasy cream on myself, then using tools with greasy hands is stupid. Spray on sunscreen is fast, easy, and can be reapplied in a snap without stopping to degrease my paws. 31. Electrical tape. Rated electrical tape is a necessity, and it can be used so many different ways. Never buy the cheap stuff. I have 3M in my bag at the moment. If you made it this far, congratulations. There are a few more tools that I use, but don't keep in my bag. Don't worry though, I will keep those for another post. I will also keep my photography bag, and my architects bag for another post. What do you have in your bag? Do you find satisfaction in your tools like I do? Have any questions about the tools listed here? Let me know in the comments.